In our day, something that has come to the forefront of people’s minds is the environment and keeping it as pristine as possible. You may be asking, “What does sustainability and the environment have to do with promotional marketing?” Well, the answer is simple—they care, and so should you. When people see that a company cares about something that they hold dear, they are usually more likely to support the business efforts of that company and become loyal to them as a brand. Enter PromoShop™ and, the first ‘green’ promotional marketing company in the industry, ecopromos™! So, what are we seeing in the realm of sustainability? One word: cork. This sustainable resource lends a sense of trendy modernism with its natural look, earthy tone and texture, and that special something it adds to products. Mention cork and the first thing most people think of is a wine stopper. Lately, however, cork is being used for every purpose we can imagine like flooring, walls, furniture, tableware, clothing, and more. 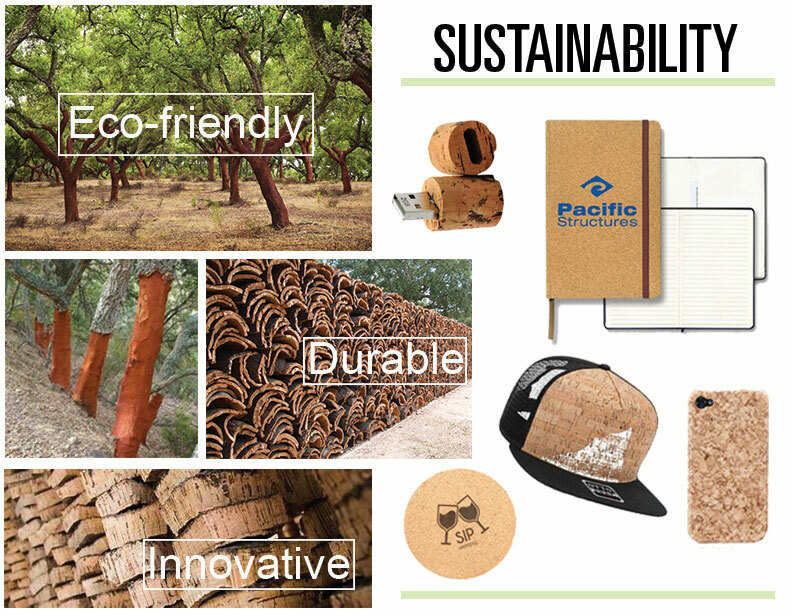 Cork is impermeable, buoyant, elastic and fire resistant waterproof and of course eco-friendly since its extraction doesn’t harm trees—all of which take cork to another level of importance for every kind of application.